I played at Birling Manor on Saturday for the wedding of Anna & John. Anna and John had a big surpise for their guests in the form of a silent disco. If you’ve not been to a silent disco before, it’s a simple concept. Each guest has a set of headphones and can choose between three different styles of music. For a wedding it allows you to have different styles of music for those with different tastes. If you both like different styles of music, you could set up your own playlists and dance to completely different songs. The atmosphere at Birling manor on Saturday was electric. It was such a pleasure to see so many people enjoying themselves, listening to different styles of music. Anna & John chose to have a 70s/80s channel, a chart channel and a garage/RnB channel to please everyone. Two of the channels were computer play lists and I played the garage/RnB. At about 11pm I decided to bring everyone together so that everyone would listen to the same songs. This is, of course tricky because everyone can decide what they listen to. But we succeeded as you can see from the photo. Everyone in a circle with Anna & John in the middle. It was an amazing moment! 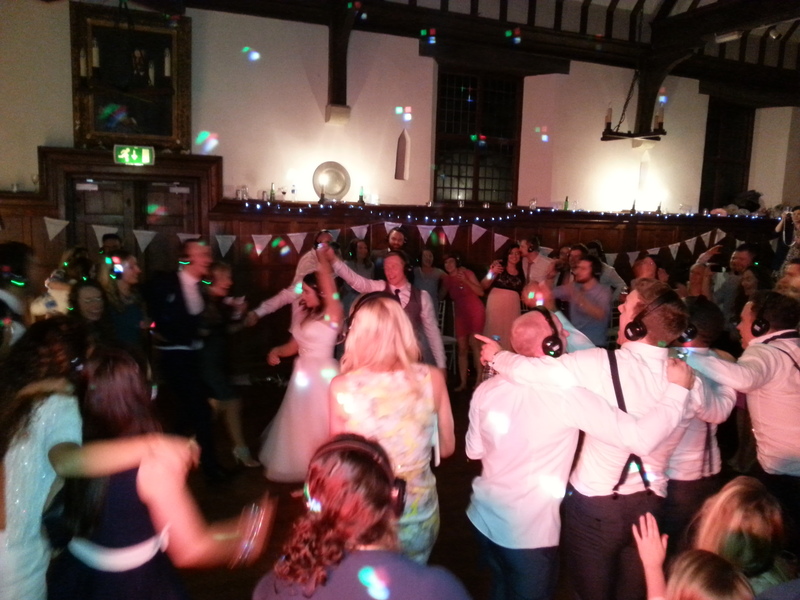 If you are thinking of a silent disco for your wedding or party, please get in touch. We can recommend a supplier for the silent disco equipment. And they will delivery everything you need to anywhere in the UK. What a brilliant night, thank you for booking me Anna & John! And I received a lovely e-mail to say ‘thank you’ this morning.